On July 21 of 1918, a U-156 submarine surfaced about three miles off of Nauset Beach and shelled the tugboat Perth Amboy and its four barges in tow. The barges were sunk, the tug badly damaged, and two were injured. Lear more about the event. This station when it was in operation was the American termination point for a telegraph cable that came directly to Orleans from France. It was called "Le Direct" the direct cable. It was installed in 1898 and was almost 3200 miles long. The first French Cable was installed in 1869 and landed in Duxbury Ma. 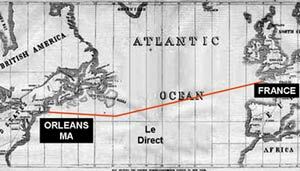 It had been routed through St Pierre Island near Newfoundland. Duxbury was a very busy shipping area and not suitable as a place for submarine cable. A lot of damage occurred from fishing and shipping operations. 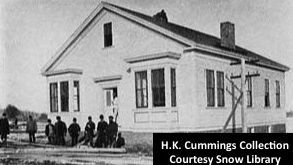 A new French Cable was laid in 1879 to North Eastham at Nauset Light and a two story station was built there. North Eastham was an isolated area and difficult to reach in bad weather. The current building in Orleans was built in 1891. The equipment and men were moved to the new building in the same year. It remained in operation until 1959 except for a few years (1940 to 1952) during WWII when it was closed for security reasons. The station was purchased in 1972 from France by a committee of 10 prominent Orleans citizens who raised the money and guaranteed a loan with their own personal assets. They then proceeded to raise money and eliminated the debt. It was opened to the public in July 1972.
located in Orleans, A Greek Revival structure that is on the National Register of Historic Places. Formerly used as the Meeting House for the Universalist Church of Orleans, this building houses the Society's Museum and is used for special exhibits and programs.